Renowned Jat Leader Shri Ram Niwas Mirdha passed away at 87 in New Delhi. He was admitted in a private hospital on January 21 after he was diagnosed with kidney infection. "He passed away at around 12:45 pm following multiple organ failure," Dr D S Rana, Consultant, Department of Nephrology of Sir Ganga Ram Hospital, where Mirdha was admitted, said. Mirdha is survived by his wife, two sons and a daughter. His eldest son had passed away on the same date last year. The last rites would be performed in his paternal Kuchera village in Nagour district of Rajasthan on Saturday. The veteran Congress leader was Deputy Chairman of Rajya Sabha from March 1977 to April 1980 and as a union minister, he held several portfolios, including home, textile, irrigation and health and family welfare besides external affairs and communication in the rank of a minister of state. Under P V Narasimha Rao, he was elevated to cabinet rank and held the portfolio of textiles. He was elected to the Rajasthan assembly thrice. As a minister in the state government, he had held various portfolios including agriculture, irrigation and transport. Congress President Sonia Gandhi had visited the hospital on Friday morning, while the Prime Minister Manmohan Singh had gone there last night. AICC media department in-charge Janardan Dwivedi said the passing away of a cultured person like Mirdha was a loss that cannot be compensated. Difference between jat or jatt is most confusing and easiest question in our Jat community as there is no difference between Jat and Jatt except Jat is Hindi word in hindi speaking states while Jatt is Sanskrit/Punjabi word. Jat community people normally mostly belongs to Hindu religion while most of Jatt people belongs to Sikh community. Former All India Jat Mahasabha President Captain Amrinder Singh is Jat and Sikh by Religion from Punjab and was elected President of Jat Mahasabha. 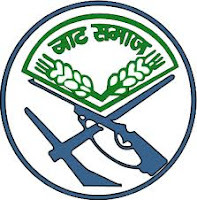 Jat or Jatt are known for high degree of self esteem and bravery. Jat or Jatt mainly lives in State Haryana, Rajasthan, Delhi, Punjab and Western UP and across globe working in various business domains. In keeping with the giant strides she has taken in recent times, Saina Nehwal on Monday was named for the prestigious Padma Shri award. The honour comes five months after she received the Arjuna award on August 29 last year for her excellent show in year. The ace shuttler, the only Indian to have won a Super Series crown in 2009, was surprised to be honoured with the nation's prestigious civilian award for the year 2010. Saina, on her part, said country's highest civilian awards would goad her to greater glory. "I would like to dedicate this achievement to my parents and coaches who have helped me a lot to improve my game," Saina said. It's really a big honour, which also comes with a lot more responsibilities. It will certainly give me a lot of encouragement. I am very happy," said the shuttler from Hyderabad. "Padma Shri" awards are given for distinguished service in any field and are announced on the occasion of Republic Day every year. The awards are conferred by the President of India at a function held at Rashtrapati Bhavan in March-April. Explosive Indian opener Virender Sehwag and distinguished coach Ramakant Achrekar are among the six sporting personalities who are selected for the Padma Shri awards. 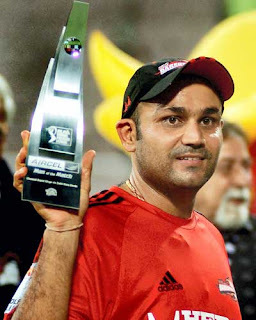 The 31-year-old Sehwag is considered arguably the most devastating opener in contemporary cricket with more than 13000 international runs under his belt. 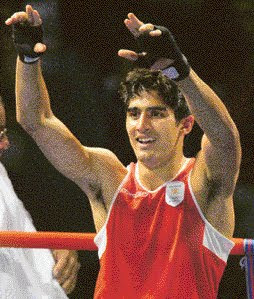 The Delhi dasher was also honoured with the Arjuna award in 2002. Ramakant Achrekar has contributed to Indian cricket in a big way by giving the country a champion batsman like Sachin Tendulkar. He is the first coach to be selected for the prestigious award. Reacting to Sehwag's selection for the award, Tendulkar said the Delhi player has made immense contribution in the improved performance of the team over the last 10 years. "Sehwag has made a terrific impact on the next generation and he truly deserves to be conferred with the Padma Shri. "To be honoured with Padma Shri is a terrific achievement. I think his achievements have been appreciated (by the government). He's a wonderful player to have in the team and has been a consistent performer for the past 10 years," Tendulkar said. * Ch.Chotu Ram Sanstha - Haryana,Delhi,U.P. Jat food habits are very simple yet delicious. Jats are mostly non-meat eaters as a result of vedic and Buddhist influence. Their staple food is wheat or bajra, vegetables and plenty of milk and ghee. Jats cosider non-vege food undesirable but some of Jats started taking non-vege food after German war. Presently the proportion of meat eater Jats is very limited. Jat women are normally quite ignorant about cooking of non-vege dishes. Jats earlier were not in habit of taking wine but it is slowly growing in modern times due to influence of other societies. Milk, curd and ghee is the main food component of Jats. Almost all Jats keep domestic milking animals. On special occasions halua, kheer and chawal are prepared. Rice is consumed with a lot of ghee and sugar. Rabadi prepared from chhachh used to be very common dish in villages. Dal, churma, baati, lapsi, Gulgule and shakarpara are also very common. Papar and mangori are made from moong and moth which are used for vegetables through out the year. Jat habitations have a plenty of kair and khejri trees. The fruit of kair is used as vegetable and in making curry. Kair is used in pickles and used throuout the year. Khejri pods, called Saangri in local language, are used as vegetables. Khichdi (also khichdee, khichadi, khichuri, khichari and many other variants) is an Indian dish that contains a combination of rice and lentils. Khichdi is commonly served with another Indian dish called "kadhi". Other common accompaniments are papads, beguni (deep fried eggplants in a besan batter), ghee (clarified butter), achar (oil based pickle), and yoghurt. Chandgi Ram Akhara in Delhi is home to about 15 girls between 14 and 20 years.In a world where wrestling has been a male preserve, ‘Guruji’ wants the girls to make a mark. ‘Guruji’ Chandgi Ram, India’s 1970 Asian Games gold medallist, set up the akhara to train women wrestlers for international events. Hope their hard work will one day brings name and fame for Nation. Veer Teja (1074- 1103) was a folk-deity who lived in Rajasthan. The history of Rajasthan is filled with lots of heroic stories and instances where people have put their life and families at risk and kept the pride and values like loyalty, freedom, truth, shelter, social reform etc intact. Veer Teja was one of these famous people in the history of Rajasthan. Veer Teja ji is considered to be folk-deity and worshiped in entire Rajasthan by all communities. He was born on Friday, magha shukla 14 samvat 1130 (29 January 1074), in the family of Dhaulya gotra Jats. His father was Chaudhary Tahar, a chieftain of Khirnal in Nagaur district in Rajasthan. As per the tradition in that area, the chieftain had to initiate the ploughing of fields after first rains in jyestha month. Tejaji's father and brother were out of the village at first rains so his mother asked Tejaji to do the halsotiya in the fields. Tejaji went to fields and started ploughing. His bhabhi became late in fetching his food locally called Chhak, which angered tejaji. On Tejaji's anger she taunted that his wife was in her father's home and it was shame on his part. This prompted him to go to bring his wife from in-laws. Bhabhi asked Tejaji that before he brings his wife Pemal, he should bring his sister Rajal so that she can receive Pemal on her first arrival to Kharnal. Tejājī was married to Pemal in early childhood at Pushkar with the daughter of Rai Mal Jat of Jhanjhar gotra, chieftain of village Paner . After marriage there was a dispute between two families in which māmā of Pemal and father of Tejaji were killed. Tejaji did not know that he was married. When Tejaji was on way to village Tabiji to bring his sister, he was attacked by Meena sardar. There was a war and Tejaji was victorious. He reached village Tabiji, got permission of her sister's husband Jogaji Siyag and brought Rajal to Kharnal. Next day early in the morning he mounted his mare Līlaṇ with palāṇ and started journey to Paner to bring his wife Pemal. It was a difficult journey, but he crossed all the Rivers running full of water due to heavy rains. He reached Paner by evening. At that time his mother-in-law was milking cows. The cows got disturbed due to Tejaji's brisk entry on his mare. His mother-in-law could not recognize Tejaji and cursed him that he be bite by a black snake as he has disturbed her cows. Tejaji got angry over this comment and decided to return without Pemal. Lachha Gujari was a friend of Pemal. Her house was about 2 km from Rupangarh. Lachhan Gujari helped Pemal to meet with Teja. For this Lachhan rode on camel and went to Teja facing many clashes with Meena sardars en route. Lachhan reached Teja and gave Pemal's message that if Tejaji does not come she will die. Parents of Pemal had decided to re-marriage her with some other person. At this time Pemal was going to die but saved by Lachhan. Tejaji came to Paner and saw her there. Pemal was a beautiful and attractive girl. They were talking with each other that they heard knock of Lachha Gujari. Lachha told Tejaji that thieves have taken away all her cows and there is no body in this to help. Tejaji mounted his mare Lilan and started alone to fight with dacoits, who had taken away Lachha's cows. Tejaji found that dacoits who had stolen the cows of Lachhan Gujari were Meena sardar's people. Tejaji, who was made for helping others, decided to bring those cows. The myth is that he encountered a snake burning in fire that was saved by Teja. That snake cursed Teja and wanted to bite Teja. In fact he had encountered with a Nagavanshi chieftain and he had a war with him. He promised to come back after bringing his wife Pemal. He was badly wounded in the process to bring Gujari's cows back from dacoits. Veer Teja was man of words. While returning he kept his words and produced himself before the snake. The snake did not find unwounded place on the body of Teja so he offered to bite on tongue. The snakebite was on tongue of Teja. Teja died due to snakebite on 28 August 1103. Historical facts are that while Tejaji was returning from Paner with his wife he was attacked jointly by Meenas, who were defeated earlier and Nagavanshi chieftains. Tejaji and his wife fought bravely with sword. Tejaji was killed in the war and Pemal became sati at place called Sursura. Tejaji's sister Rajal had also become sati which is a unique example of sister becoming sati in the Indian history.